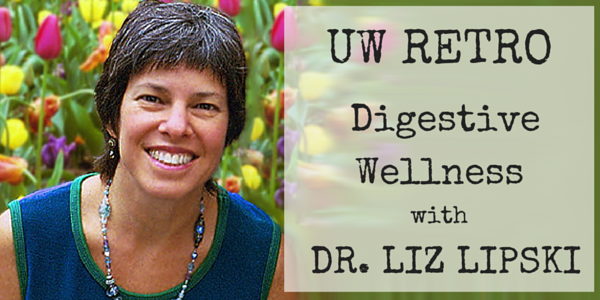 Dr. Liz Lipski, author of Digestive Wellness and Digestive Wellness for Children, stops by to discuss the many things that can go wrong with our digestive systems – and how to fix them! 10:05 What Dr. Lipski does all day and how she got so interested in digestion even though she didn’t mean to! 13:52 The role of the standard American diet in our digestive troubles and the one concept that’s really missing from the food pyramid. 18:58 What to look for—and what to do—when your kids tell you their tummy hurts. 21:15 Are germs good for us? All about the Hygiene Hypothesis and how our obsession with going germ-free could be affecting our health. 24:51 Why you should drop that yellow M&M and definitely not give any to your kids. 27:21 The very best way to clear out your colon. Plus, who does and does not need colonics. 32:15 How to wean off herbal laxatives and the questions to ask yourself to get to the bottom of why you needed them in the first place. 37:05 What to look for in stool testing results, and what we can do if our gut bacteria aren’t doing what they’re supposed to do (or are missing completely)! 44:39 The constipation/cancer connection: why it’s time to embrace the fact that everybody poops. 48:55 Is it too much stomach acid or not enough? How to test the “strength” of your stomach and why it’s so important for your health. 56:31 All about digestion and autoimmune disease, and exactly what you should eliminate from your diet to feel better. 1:02:50 What your mood and your mind have to do with your gut, and what you can do to for a healthier and happier digestive system. 1:10:45 The power of probiotics, the microbiome, and the many messages we send our bodies all the time. This entry was posted on Thursday, October 29th, 2015 at 10:54 am and is filed under Uncategorized. You can follow any responses to this entry through the RSS 2.0 feed.